Our Chairman, Mr Lim Ching Seng, started the business as a sole proprietorship under his own name back in 1947. The business, which was renamed as Chop Chin Leong three years later, acts mainly as dealers in paints and building materials. Operating from its humble premises in 142B Rangoon Road, the entrepreneurial journey was far from easy. Mr Lim recalled those early days, "In the year 1938, I left my homeland to settle down in Singapore and earn a living. During those days, there were difficulties in getting jobs and in setting up businesses, but with sheer determination and courage, I succeeded in overcoming all obstacles that approached my path and managed to set up a business on a very modest scale". The first step towards our chemicals business in the present day came in 1959, when we started importing chemicals, solvents and paint raw materials from overseas. In the same year, we expanded into the Malaysian market. With the remarkable progress made during these early years, a piece of land of approximately 5,855 square metres at Lorong Puntong (off Thomson Road) was acquired for the purpose of building storage facilities. Our business flourished after Singapore gained independence in 1965, both as a result of the rapid growth of local industries as well as the overwhelming support received from our valued customers. 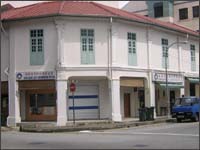 Along with our rapid expansion, the business was incorporated in 1973 under the name of Chin Leong Paints Pte Ltd.
As our business gradually diversify from manufacturing of paints into trading and manufacturing of chemicals, the company was renamed as Chin Leong Paints and Chemicals Pte Ltd in 1980. In the same year, Chin Leong Construction Pte Ltd was established, to undertake waterproofing projects. In 1982, we moved into our present premises at 2 Tanjong Penjuru. With the availability of greater space and facilities, we also started the import of bulk chemicals. In the mean time, our bid for regional presence took on a greater momentum, with the setting up of a number of overseas offices in Malaysia, China / Hongkong , Taiwan and Vietnam. Our other key markets in Asia include Thailand and Indonesia.